Dr. Doan and her staff are here to help you achieve the healthy, beautiful smile you’ve always wanted. She has many years of experience in treating complex orthodontics cases. She’s lived throughout many areas of the US, from the West coast to the East coast but considers Northwest Houston her home. 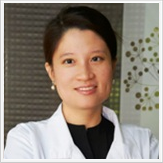 Dr. Doan has trained at some of the most prestigious institution in the US, graduating from the University of California Los Angeles with a degree in dentistry where she pursued her research interest in molecular biology and frictional biomechanics, which deepened her understanding and appreciation for orthodontics. She attended the renowned Columbia University in New York City for her specialty training in orthodontics. During her residency, she also was selected to teach courses to the graduate dental students at Columbia University. After completing her orthodontics residency, Dr. Doan began her private practice career in Tomball and Cypress. She looks forward to seeing you and your family in her practice. To book an appointment with Dr. Doan, please click here.